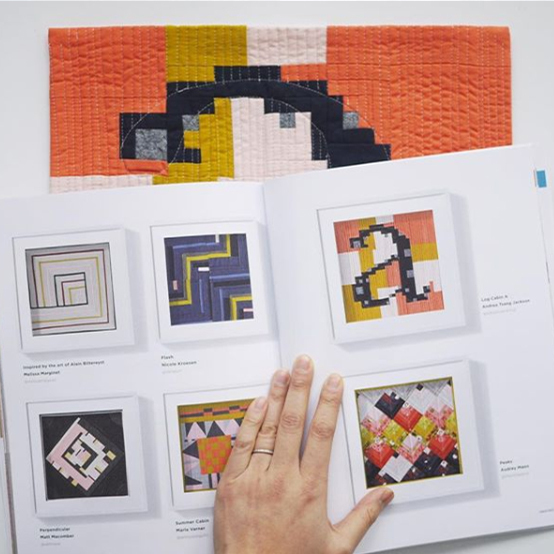 Perhaps you've seen her work in the pages of UPPERCASE magazine or in an issue of Curated Quilts for her "Log Cabin A". Or was it in Quiltcon 2018 issue for her "Everyone's Got an X"? Wait, maybe you heard her on Modern Sewciety's (episode 124) podcast. 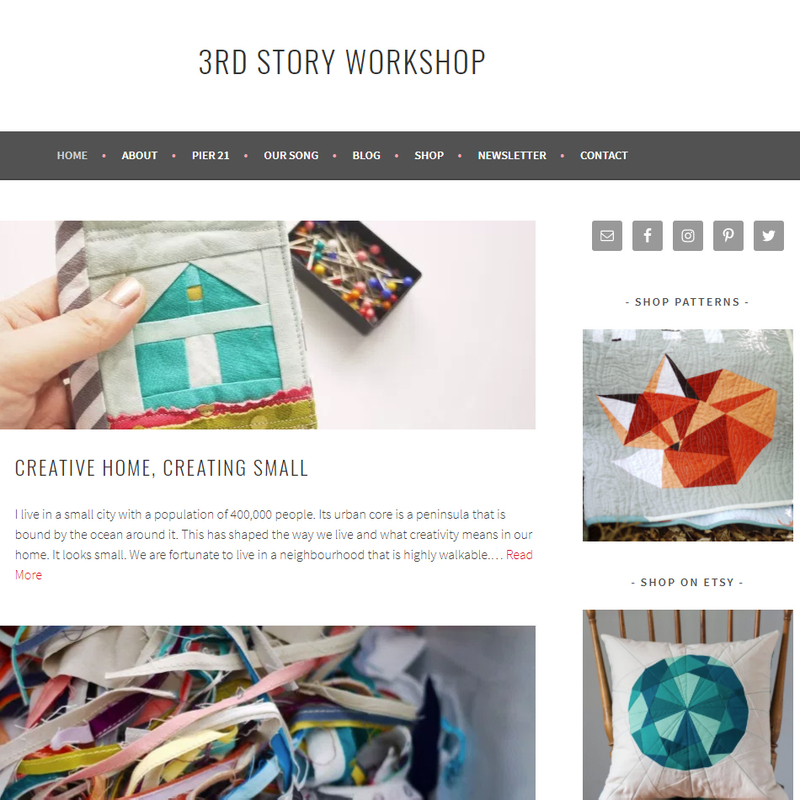 But then again maybe you first found @3rdstoryworkshop on Instagram. That's how Andrea landed on my radar. Her feed is pretty darn dreamy. 1. In 2017 you completed The Here and Elsewhere Bee (compiling nearly 1,200 immigration stories) as an Artist in Residence at the Canadian Museum of Immigration at Pier 21. A) How did this project come about? For a few months, I had the idea in my head that everyone should know what quilting looks like today. 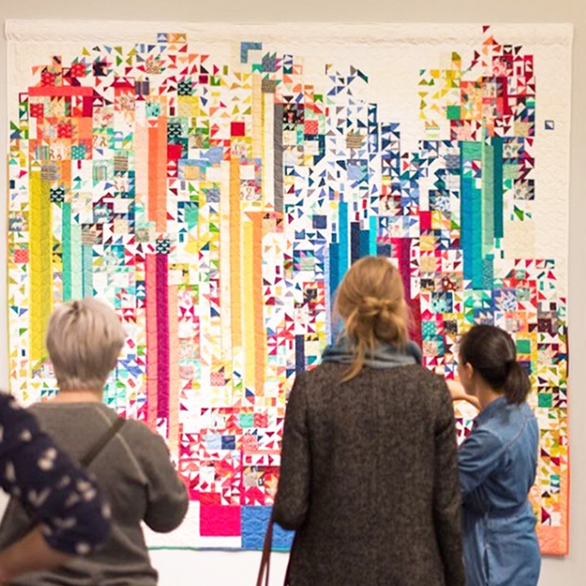 When I saw Libs Elliott's Unity quilt from New York Design Week in 2016, I thought that a public, collaborative quilt would be a great vehicle for that. In early 2017, the Canadian Museum of Immigration at Pier 21 put out a call for proposals to engage their visitors in an art project that would respond to an exhibit they had on display. The project was selected through the proposal process and I had the opportunity to make the idea become a reality. B) The project was inspired by the children's story book "Selina and the Bear Paw Quilt". How did you come across this book and can you describe your "ah ha!" moment, when you knew you had to do this project? I had a friend introduce me to the book in 2016, which I had never encountered before. It was such meaningful story and I thought it would be a great way to do a modern spin on a traditional quilt block. When the call for proposals came out for the artist residency at Pier 21, I thought this would be a perfect opportunity. I thought that this would be an excellent way to build a collaborative quilt and to relate visitors' experiences at the museum to their own personal story. C) I would imagine the project and stories were quite emotional. How did that affect the work. And you? It's amazing to think of what is behind a single little 5" or 2.5" block -- the people whose lives were turned upside down because of war, in search of opportunities, in the quest for a more peaceful life. People come to the Canadian Museum of Immigration often on pilgrimages to honour their family members that risked a lot to make a better life. When they came to my little studio in the museum, they had just absorbed an intense amount of information about Canadian immigration. But here was where they made it personal; they paused to think about what brought their families to Canada whether it was 300 years ago or 2 years ago. And yes, it was emotional: "My grandmother raised me; she came to this port when she was a little girl. And the life I lead now is a result of that moment."... "My father was 15 when he had a gun put to his head, and asked, 'Are you with us or against us?' My choices are along the lines of, 'Should I get this car or that one?' What he went through was all so that I could have freedom." The weight of what's behind the quilt is tremendous. The emotional impact of the piece really hit home that what I'm doing as an artist isn't only for my own self-fulfillment. The project really forced me to turn outward and see how the work and the process could affect people's experiences. This project made me realize that for me, interacting with the public is an important part of what I will do from here on in. 2. When did you move to Halifax in Eastern Canada? Where did you move from? How has that move affected your work? 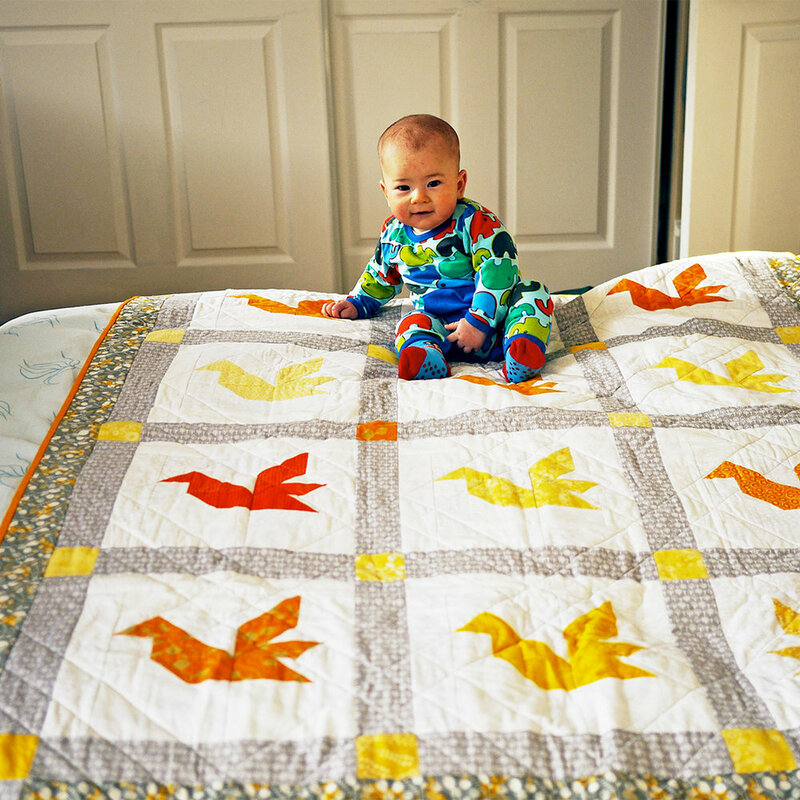 I was born and raised in Ottawa, which is also where I made my first quilt and had my first baby in 2011. We moved to Halifax a year later for my husband to pursue a graduate degree. It was not until early 2016 that I joined the Maritime Modern Quilt Guild and that's how I started quilting seriously. I had no idea about the modern quilting movement before that, nor had I encountered other quilters. The community of people that I have met here and that I have since encountered online has been a huge motivator for my work. 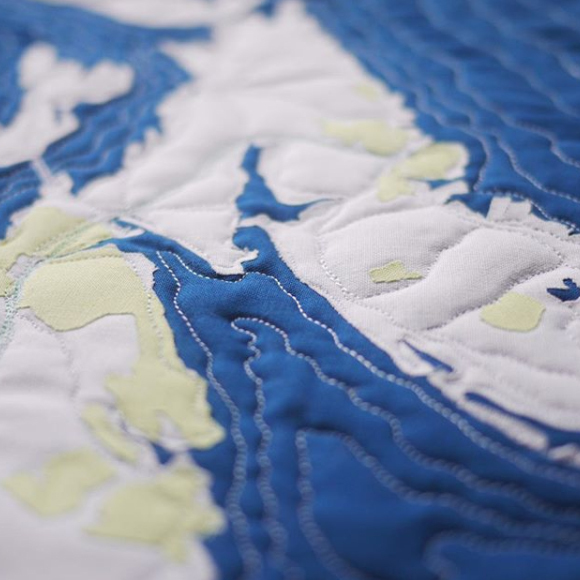 To understand the range of voices represented and how I fit in the quilting world has been informed by jumping into the MQG world. 3. 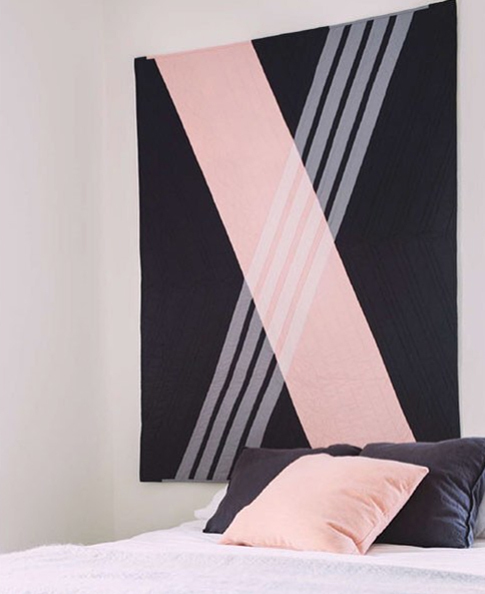 Do you do all your own quilting? Mostly I do, but The Here & Elsewhere Bee was the first that was too big for me to accomplish myself, so I had Sheri Lund of Violet Quilts to do it for me on her long-arm. Moving forward, I will most likely do my own if it is a one-off artistic work, but if it is a pattern sample or something of the sort, I'll have it long-armed by someone else. 4. What makers tool could you not live without? I wish I could tell you that it was more of a physical tool or notion, but I'm pretty reliant on Adobe Illustrator to make my designs come to life. It allows me to design and test ideas quickly without the commitment of cutting into fabric. I can work out how to cut the fabric and how much I need so I that I can execute a design relatively smoothly. Using Illustrator allows me to design with very few limitations -- which gets me into trouble sometimes when I'm actually sewing and creating, but I'd rather feel freedom first and then deal with the tricky bits later. 5. What's your favourite colour? What's your least favourite colour? And why for both. I have a lot of favourite colours and they are all neutral! Black, white, grey, navy, metallic gold. I like that they go with so many other colours and in the way that I imagine them, they are decidedly modern. Moreover, when colour isn't central to the visual impact, the forms and shapes come through more clearly. These also never go out of style. My least favourite colour is brown, but I love it when it's from a natural source like wood, leather or cork. Again, form can show through when it's a natural hue. Another one that I dislike is purple. I just don't know how to go about it. With it being this year's Pantone Colour of the Year though, I'm coming around to it by seeing its applications. I am just not sure how it will have lasting power. 6. What book are you reading right now? Confession: I actually... dislike reading. For someone who went to school until they were 26, I am extremely slow at it and it frustrates me. I've taken to podcasts and that way I can keep my hands busy while taking in information. I will likely be getting into audio books soon. AND A LITTLE SNIPPET FROM NEXT TUESDAYS NEWSLETTER, PART TWO WITH ANDREA ...1) My favourite podcast is 99% Invisible. Ten days until Quiltcon! That's nine sleeps! It seems like it's coming up fast. Maybe that's because I decided in December to go. I don't have any workshops or lectures booked. I don't even have tickets to get in. I'm just going to wing it! I'll figure it out when I get there. At least I have a place to stay... phew! And because I'm off to Quiltcon I also decided that I needed a new bag (perhaps for some fabric purchases? Maybe, just maybe). It was also the perfect excuse to go for an idea I've been sitting on for a while, a Boombox bag! I bought a Metallic Fat Quarter Bundle from the Fat Quarter shop. It has ALL the sparkly fabric I could ever need. The bottom half of the Boombox is done, now I'm on to the top... and making the bag part. That too. RECOMMENDED PRODUCTS: For just winging it, one thing I have locked and loaded are cards for Quiltcon. I picked them up this week and I'm pretty tickled with them! I'm teaching some workshops this year so I thought I should have some to hand out. That and MOO Cards had a 25% off sale, wink! I also decided to get some greeting cards printed up. I missed sending out Christmas cards by a country mile so my new plan is to send out a few cards every month throughout the year instead of trying to do it all in the month of December. I was very pleased with Social Print Studio's speed and quality. I had never tried them before but I will be ordering from them again. They've got some really unique services and a killer sense of humour! RECOMMENDED PATTERNS: One of my favourite designers is Berene Campbell @happysewlucky. Have you been following her tattoo quilt? It's amazing! It's full of love, wisdom and hope. Literately! She's mostly active on Instagram but she also blogs HERE. And if you love her work as much as I do you'll want to check out her Etsy shop HERE. I highly recommend her patterns! I've got big plans for mine but I'm still in the hoarding fabric phase. Keep an eye on this lady, she's amaze-balls. OH WAIT! I almost forgot! This past week I discovered my Roller-skate surface pattern designed was posted on Print & Pattern's website, for Make it in Design's graduation round up. The discovery was well worth an all out happy dance!